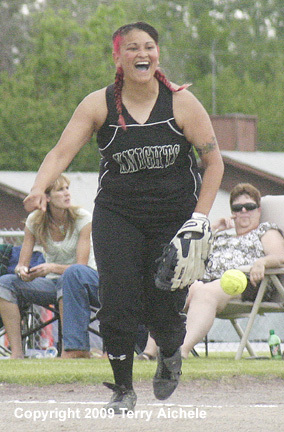 IRRIGON - The Irrigon Knights defeated the Enterprise Joseph Cubs 6-2 in a quarterfinal softball game Friday, May 29, 2009 at Irrigon. 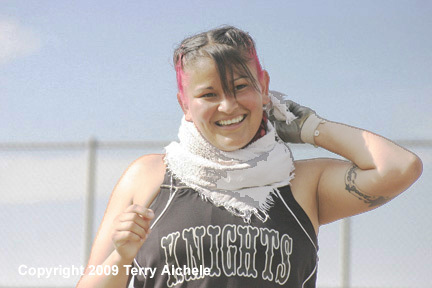 The win moves Irrigon on the semifinal game against Gaston on June 2, 2009 time TBA as of publication on Sunday. 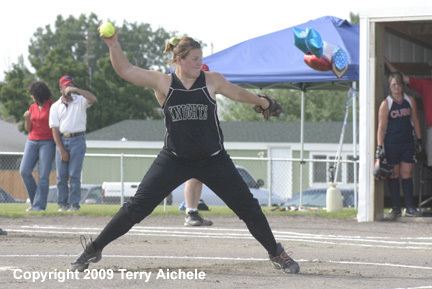 The winning pitcher for Irrigon was Noelle Wright. 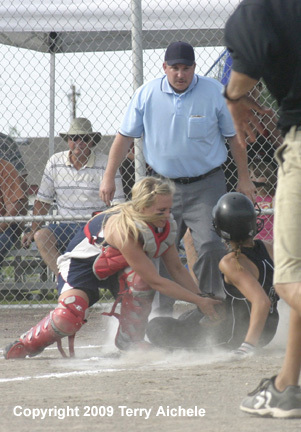 The Knights catcher was Staci Stanger. 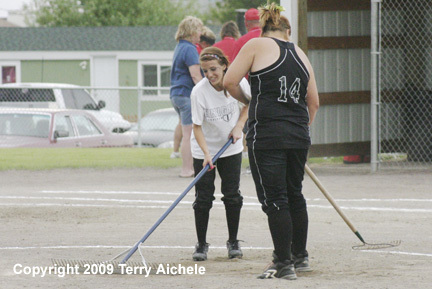 The losing pitcher was Andrea Schaefer for the Enterprise Joseph Cubs. 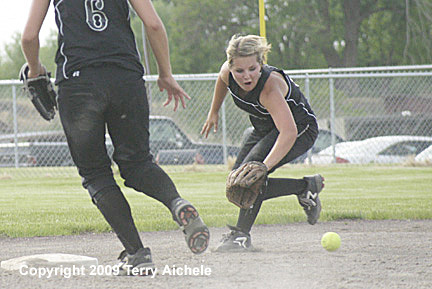 Irrigon secondbaseman Jessica Henrichs was responsible for eight outs in the game. During the fourth and fifth innings Henrichs either made the out or assisted in five of the six outs. A stellar performance by the secondbaseman. The Cubs failed to score in the top of the first as they flew out to right, struck out and grouned out on a hit to the pitcher who tossed it to first for the third out. 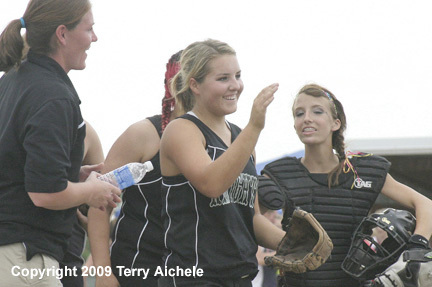 Irrigon got on the scoreboard in the bottom of the first when Ariel Schoik and Noelle Wright both walked. With Schock and Wright on first and second Leslie Coffman hit a shot to right field allowing Schoik to score the Knights first run from secondbase. Alisha Mego then hit to right field bringing in Wright and Coffman giving Irrigon the 3-0 lead. The Cubs got things going in the top of the second when Mariah Warnock was safe at first on a grounder to third which was thrown wide at firstbase. Then Jesse Kohlhepp hit to right field allowing Warnock to score from second. Irrigon led 3-1. Irrigon set up for their scoring in the bottom of the second with leadoff batter Cheyenne McKenney walked. Breena Tolar then laid down a sacrifise bunt which pushed McKenney over to second. 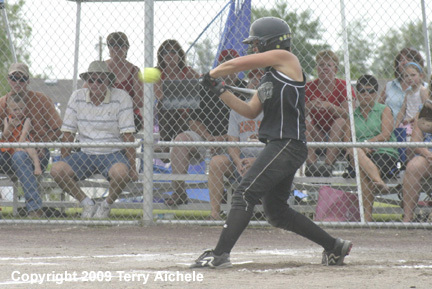 Jessica Henrichs then hit a long fly ball into rightfield. 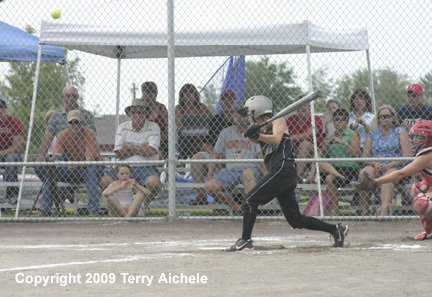 Ariel Schoik then came to bat. Henrichs stole secondbase. With McKenney at third and Henrichs at second Schoik hit a fly ball to rightfield. The fly ball allowed McKenney to score. Irrigon led 4-1. Noelle Wright then walked loading up the bases. Kim Campos was hit by a pitch forcing in Henrichs from third and giving the Knights the 5-1 lead. Leslie Coffman then hits a grounder which the fielder fires to home to take out Schoik. Then in the throw to first Wright scores giving Irrigon the 6-1 lead. Bailee Reimer hits a triple to start off the top of the third for Enterprise Joseph. 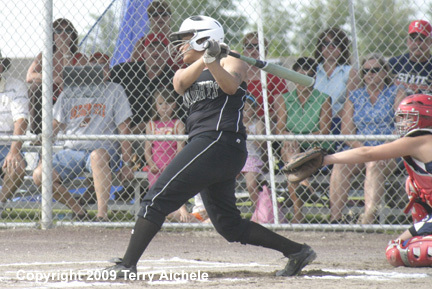 Tonya Neil then hit a grounder to secondbase and made it safe to first scoring Reimer from third. The Knights led 6-2. The Knights went three up and three down in the bottom of the third. 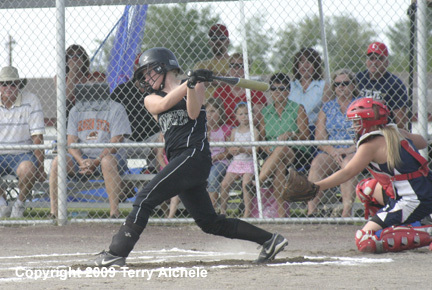 Jessica Henrichs had a first rate defensive top of the fourth. Cub hitter Warnock hit a popup that Henrichs caught for the first out. Then Kohlhepp hit a grounder right at Henrichs who fielded the ball and tossed to first for the out. Finally Katie Edison hit a grounder to Henrichs who threw to first for the third out. Irrigon got a runner on base in the bottom of the fourth but couldn't generate any runs. Irrigon continued to lead the game 6-2. In the top of the fifth Irrigon's Wright struckout the Cubs Reimer. Neil then flew out to Henrichs at second. 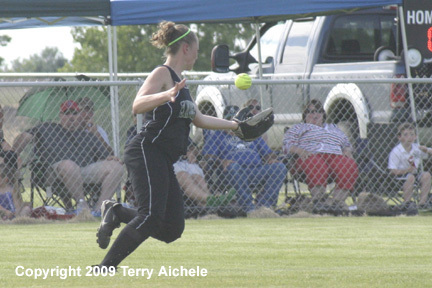 Whitney Shaefer then hit to centerfield. Summer Despain of the Cubs then hit a line shot to Henrichs who caught it with no problem for the third out. Irrigon got a runner on base in the bottom of the fifth but couldn't score. Irrigon continued to lead the Cubs 6-2. The pitching and fielding was very tight for both teams in the final two innings. 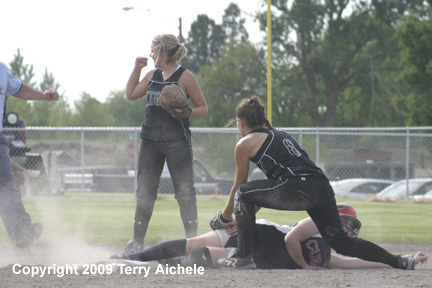 Irrigon pitcher Noelle Wright and her fielders did not allowing any Cub on base in the closing innings. Irrigon was able to get runners on base in the bottom of the sixth but couldn't get a score out of the situation. On the final out, Tonya Neil of the Cubs grounding out to Henrichs and Campos, the Knights and their fans let loose with cheers, smiles and high fives all round. The players took a few moments to meet with their families and friends before going to work on the postgame field work that they do after every game. "I played a really great game." said Jessica Henrichs about her defensive work at secondbase. "I have to thank my coach. He pushed us all week so hard. This is crazy, I never thought it was going to happen." "It feels really good going on to semifinals." said Noelle Wright after the game. "When the game first started it was really hot. I stood under a fan. And I was a little nervous. After I got into the game and pitched to them I felt like, oh they couldn't touch me so I'm going to pitch it. I worked them outside and I worked them inside. They have some really good hitters." "I feel better than I've ever felt before." said shortstop Leslie Coffman. "It was hot, I'm glad the sun finally went away."